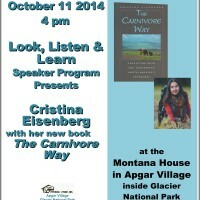 The Montana House and the Glacier National Park Conservancy are pleased to co-host a Look Listen and Learn event with science writer and wildlife ecologist Dr. Cristina Eisenberg. Her presentation will be based on her forthcoming book The Carnivore Way: Conserving and Coexisting with America’s Carnivores (to be published summer 2014) and on her scientific research. 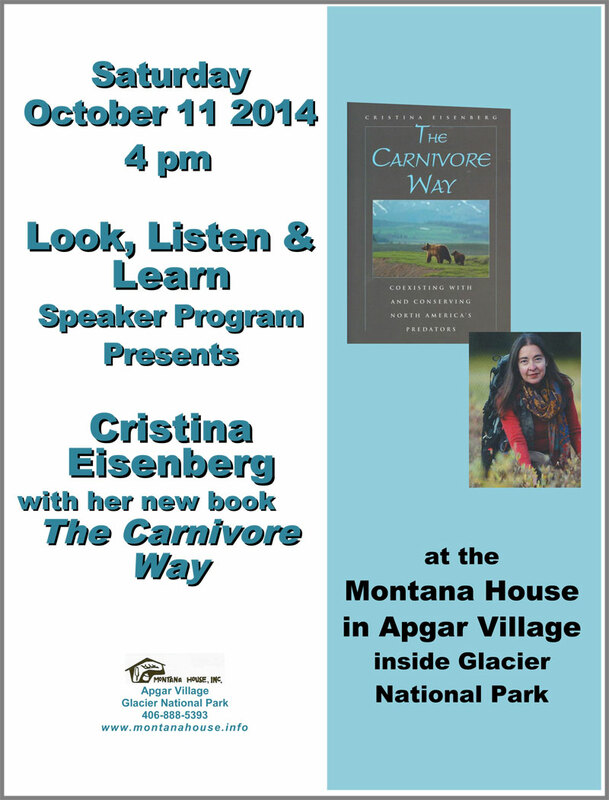 The event will be at 4 pm Saturday afternoon, November 23rd, at the Montana House in Apgar Village. Aldo Leopold wrote, “The first precaution of intelligent tinkering is to preserve every cog and wheel.” He and other early ecologists found that carnivores such as grizzly bears, wolves, and lynx have essential roles in creating healthy ecosystems. However, human activity and climate change threaten their survival. Dr. Eisenberg will discuss the historical conservation status of six species of large carnivores in the American West from Alaska to Mexico and the steps we have taken to enable them to repopulate landscapes from which they had long been missing. She will show why the Crown of the Continent Ecosystem is a critical linking landscape and will identify pathways to coexistence with these amazing creatures. Eisenberg holds a doctorate in Forestry and Wildlife from Oregon State University where she currently teaches ecological restoration and natural resources policy. Her food web research focuses on the ecological effects of wolves and fire on Rocky Mountain ecosystems. Her previous book The Wolf’s Tooth: Trophic Cascades and Biodiversity was published by Island Press in April 2010. She also serves as the nonfiction editor for Whitefish Review. An Aldo Leopold scholar and a hunter, Cristina has lived in northwest Montana for many years.